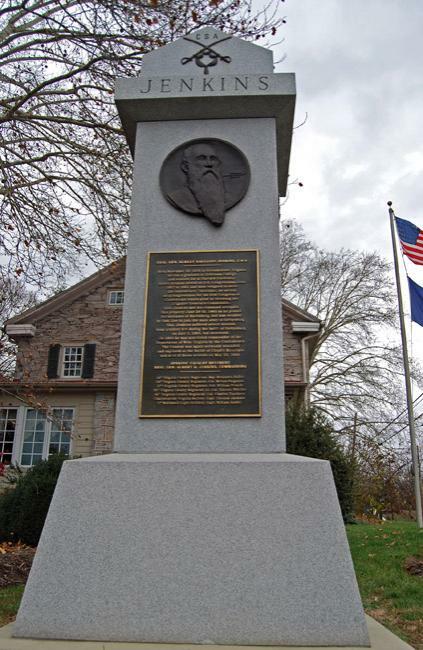 There is a monument honoring Confederate general Albert Jenkins in Mechanicsburg, Pennsylvania –paid for by donations from local residents and organized by the Camp Curtin Historical Society. It is the northernmost memorial for any Confederate officer and probably the only one paid for by northerners. Yet Jenkins was one of the most controversial Confederate officers, one who destroyed northern civilian property and whose men conducted what they called a “slave hunt,” kidnapping black people during the Gettysburg campaign and hauling them into slavery in the South. You can read more about Albert Jenkins at the House Divided Project research engine and more about the planning for the memorial at Camp Curtin Historical Society. To learn more about the “slave hunt” conducted by Jenkins’s cavalry, see these articles from the Pittsburgh Post-Gazette and the New York Times Disunion series. On the question of whether or not this monument stands as a helpful symbol of national reconciliation or as a disgraceful obliteration of the past, that is for readers to decide but we would welcome your comments below. This post originally appeared in April 2015 and has been updated to reflect some recent developments in the debates over Confederate flags and monuments.